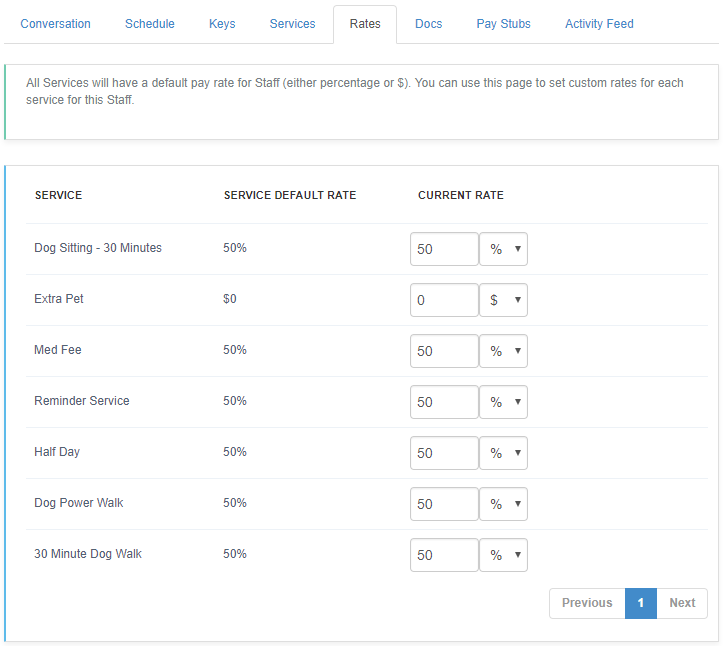 When creating or updating a service, you can set a default pay rate for staff members. This determines how much, by default all staff members are paid for a service. For example, you might specify that for “Dog Sitting – 30 Minutes” you want to pay all staff members 50% of the total cost. If you have certain staff members that earn a different amount than the default you can easily customize how much they earn for each service. For example, if the default value is 50% of the service cost, you might want to specify that Jane Smith earns 60% rather than the default 50%. This guide shows you how to specify that custom pay rate for staff members. Using the sidebar navigation select “Staff”. Find the Staff Member in the list of staff and click on their name. Each row in this table is a service. You will see the Service Name, how much the default pay rate is, and what this staff member is currently being paid. Notice how the staff’s current rate is editable. To edit the pay rate for a service, edit the “Current Rate” by using the input fields. Once you have finished editing a rate, be sure to click the save button next to that rate. You will notice that by editing the staff member’s “Current Rate”, a new button appears to the right “Use Default Rate” - use this to undo any custom rate you have set. Staff pay rates are used to determine how much the staff member is paid when generating their pay stubs.